Despite calling for an end to the directly elected executive mayoral system we are standing a candidate, John Hamilton, who set up the Bring Back Democracy campaign in 2006 to abolish the post. 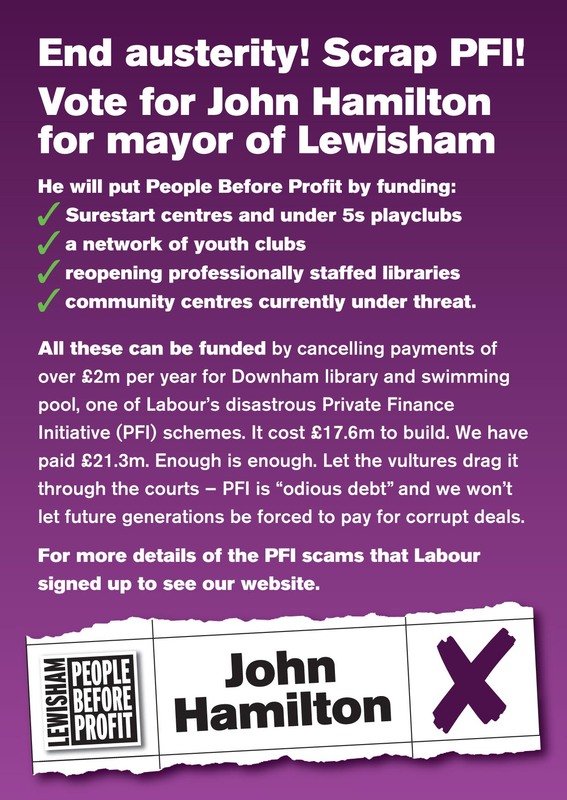 John is a founder member of Lewisham People Before Profit and he has pledged to only accept the average Lewisham wage if elected as Mayor. In the election for mayor you can also give a second preference. If you are usually a Labour voter but you are unhappy with Damien Egan's lack of commitment then please put John Hamilton as your first preference and put Damien second. We all know that he will probably win but a strong vote for People Before Profit will help persuade him to implement the right policies for the people of Lewisham and not for the big outsourcing companies and developers. After a further action in which we lived for a week in a temporary house made of estate agents boards on the town hall lawn (see video: House of Cards – Lewisham Housing Protest) the mayor promised to build 250 new council houses by 2017. He then doubled this promise to say 500 new council homes would be built by 2018, this year. In fact he has built just 17 and the target of 500 has been reduced to 340 according to the head of Lewisham Homes but both Steve Bullock (in his letter accompanying the council tax bills) and Damien Egan (in his letter to voters) are still pretending that they are planning to build 500. The tower blocks in Lewisham are all for private sale, no affordable or even unaffordable rented flats are being planned, even though the council has a policy that requires any development of more than 9 homes to include 50% affordable rented accommodation. Damien Egan and Steve Bullock have not insisted on their own policy being met and have allowed developers to do whatever they want under the excuse of “viability criteria” which really means maximising profit. Many people hope that Jeremy Corbyn will change the Labour Party from the party that took us to war in Iraq and Afghanistan, that crippled the public finances with PFI debts and brought in tuition fees for students into a party calling for many of the same things as Lewisham People Before Profit was set up to achieve: rent control, an end to privatisation and an NHS free of debts to private banks run for the benefit of us all. There is little doubt that Jeremy Corbyn wants all these things and more, but the Labour Party in Lewisham has been spectacularly resistent with Heidi Alexander, MP for Lewisham East, being a leading conspirator against Corbyn while she was shadow health secretary and saying he was wrong to say he would never press the nuclear button. 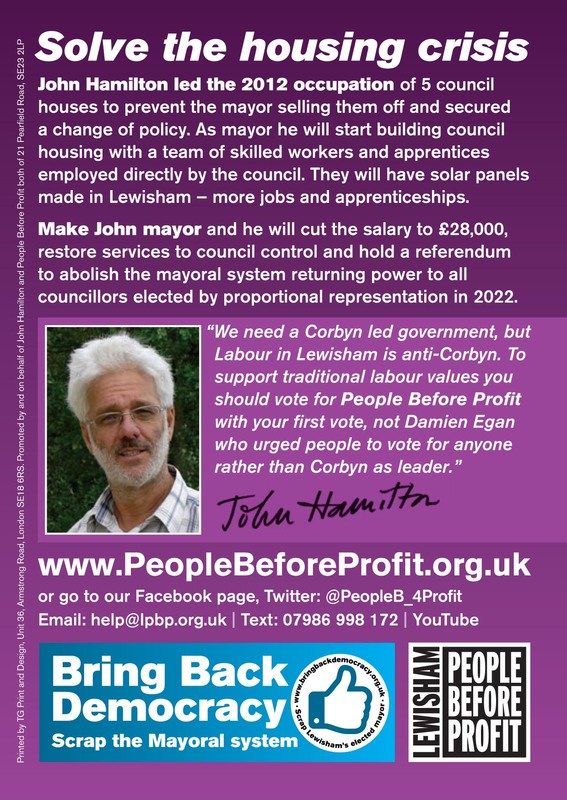 During the campaign to choose a leader of the Labour Party Damien Egan was one of 20 Lewisham councillors who signed a letter in the local press urging people to vote for anyone rather than Corbyn. Damien Egan now says that although he added his signature he didn't check what he was signing and claims now to be a supporter of Corbyn. We are glad to hear that, but would rather have a mayor who checks what he or she is signing before doing so! Northern Ireland, Scotland use Single Transferable Vote in elections for local councils but English councils are stuck with the archaic First Past the Post system which is also used for parliament. Wales has just agreed that councils can choose to use STV in these forthcoming local elections. In Single Transferable Vote elections the voter lists candidates in order of preference and most people end up getting someone elected who they put in the top three choices. With First Past the Post voters in Lewisham have three votes to use in and because more people voted for Labour than for any other candidate in all wards except Brockley we have had 53 Labour councillors and just one Green Party councillor, despite Labour only getting 40% of the votes. Lewisham People Before Profit came second in average vote per candidate and average party share of the votes and in a fair voting system based on these voting figures we would have seen 22 Labour councillors, 8 LPBP, 7 Greens, 6 Conservatives, 6 UKIP, 4 Lib-Dems, 3 TUSC. Of course in a fair voting system using Single Transferable Vote many more people would probably have bothered to vote because at the moment the result is a foregone conclusion so what's the point? Single Transferable Vote allows voters to choose between different wings of the same party – pro-Blair or pro-Corbyn, Remain or Leave, whereas at the moment the party machinery decides who is the candidate and in Lewisham's Labour party strenuous efforts, often anti-democratic, have ensured that few Corbyn supporters are on the ballot paper. Lewisham People Before Profit is unlikely to stand any candidates in the local elections because we think it is a waste of our energy. If other parties were to do the same we could save a lot of money by not having to run the elections. Councillors have no power anyway while we have the executive mayoral system so we will be putting our energy into abolishing the mayoral system – Bring Back Democracy section of this website.